I never thought I'd fall in love with a supermarket. I'm so small-scale, so know-your-food, so hit-as-many-small-markets-as-you-need-to, but... Central Market is complete foodie heaven, and I don't think I'll ever be so happy buying food all in one location again. CM carries low-end, high-end, hard-to-find, rare, fresh, local, far-flung, made-there-that-morning, anything you could possibly need. 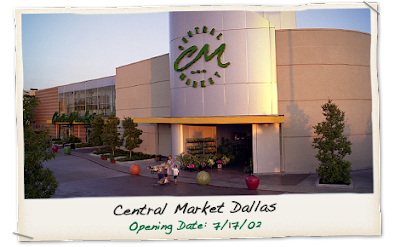 Central Market has eight locations, all in Texas, and I am going to miss it like crazy. No more absolute confidence that one-stop-shopping will produce every rare ingredient I need for my exotic recipe. No more gorgeous flowers by the armful at the same place I get local produce and fancy cheese and bulk grains/spices and cases upon cases of sustainable meat and seafood and a ridiculous selection of beer and wine. No more. No more?!?! CM, make your way up to the mid-Atlantic! Please? sigh. CM is the thing I miss the most about Dallas (excluding friends etc. really just about the city). Our first week in Chicago I went to Whole Foods trying to recreate the magic of Central Market and instead i came out with one very over-priced $49 bag of groceries. And can we talk about the guacamole samples at CM? heavenly! The Twin Cities had a couple of swanky all-in-one markets like that, where even the interior is pleasant and puts you at ease, the flowers are awesome and the deli & bakery are super delicious. I'd forgotten how much nicer they were than an average store until I stopped into one on a trip there a couple of years ago. I agree that Whole Foods can't hold a candle. WOW, that place looks fabulous, a foodie mecca. wow! we could definitely use some place like this in the DC area! I'm jealous! Jealous! While I have a feeling it does not even begin to compare, you might enjoy stopping by the D.C. Eastern Market if you haven't already. CM, or "the Food Museum" as I like to call it, is totally crush-worthy. Think DC has a similar place with a cult-like following - is it Freshfields? If I think of it, I'll let you know.